The number of people applying to university has increased for the first time in three years – boosted by a record number of non-EU applicants. Figures from Ucas show 561,420 people have applied to start a course in 2019, up for the first time since 2016 when the number was 539,720. The increase is mainly due to a record 63,690 students from outside the European Union applying to UK institutions, an increase of 9% compared to last year. In England 38.8% of the 18-year-old population applied. This was a 1.4 percentage point increase on the application rate at this time in 2018. It comes despite a 1.8% fall in the total number of 18-year-olds in England. In Northern Ireland, 46.8% of 18-year-olds applied to university by the January 15 deadline, along with 32.5% of those in Scotland and 32.2% of those in Wales. The number of applicants from China increased by a third this year – rising from 11,915 to 15,880. 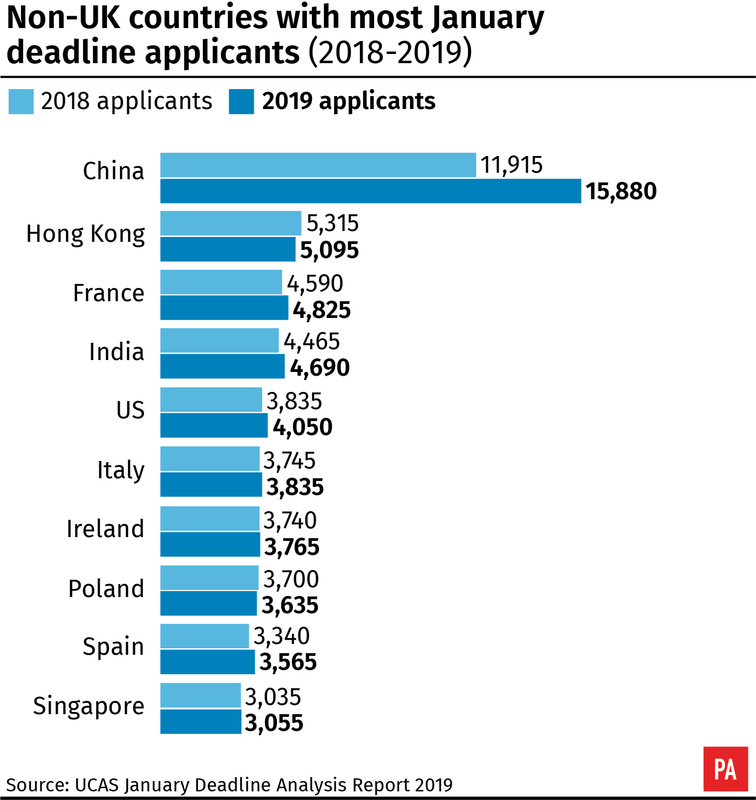 This follows an increase of 20.6 per cent last year, and brings Chinese applicant numbers to almost the same level as those from Wales and Northern Ireland (18,855 and 17,910 respectively). The number of applicants from the European Union increased by 1%, to 43,890. Clare Marchant, Ucas chief executive, said: “In this time of uncertainty, it’s welcome news to see more EU and international students wanting to come and study in the UK. “Alongside this, demand from UK 18-year-old students remains strong, despite the falling numbers of this age group in the population. Alistair Jarvis, chief executive of Universities UK, said: “It’s excellent to see that 18-year-olds in England increasingly value a university education, with a record rate of applications. “We are also pleased to see a record high in the percentage of young people from disadvantaged areas applying to university. Anthony Seldon, vice-chancellor of the University of Buckingham, said: “Given the challenges the sector is facing we are thrilled that the University of Buckingham figures have risen 25% in the last year. “It’s tremendous to see demand for UK degrees remains strong with home as well as overseas students, including those from the EU. “The health and vitality of universities is not of interest only to them but to the whole country. “We should wake up to the very real risks that Brexit poses for universities.